This Deluxe Mac and Cheese for Two is quick and easy to throw together and makes the perfect vegetarian meal for two or side for three or four. Hey, happy Monday! How was your weekend? I have something warm and cozy for you today. As I saying in my Bacon and Butternut Squash Side Dish post last week, this time of year, as it starts to get colder, I always start craving comfort food. So I figured it was about time to share one of my favorite comfort foods in the world, Macaroni and Cheese! I have a couple Mac and Cheese recipes on the site already. There is my classic Quick Mac and Cheese for One, which has been super popular, and Bacon Butternut Squash Mac and Cheese, but today’s mac and cheese is the deluxe version. 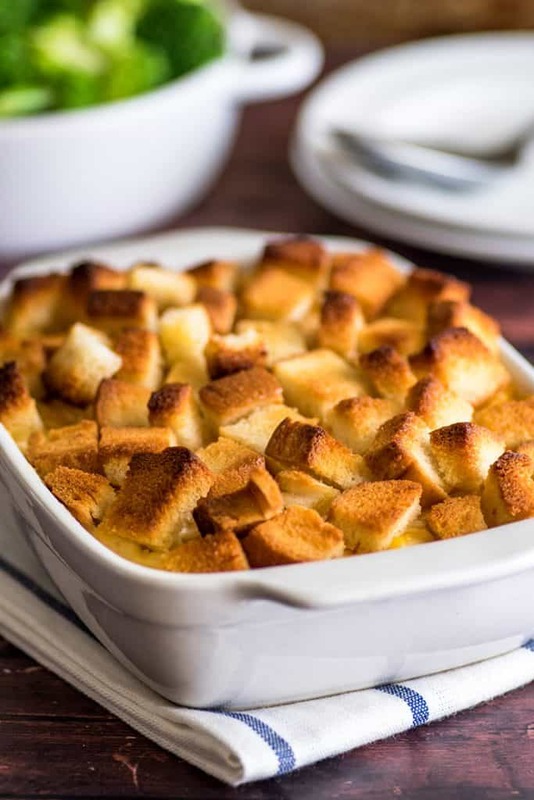 It’s made with cheddar cheese and Parmesan (or Pecorino Romano if you have it–my favorite) and topped with buttery, toasted bread cubes. It’s my FAVORITE way to eat mac and cheese and soooooooo good. 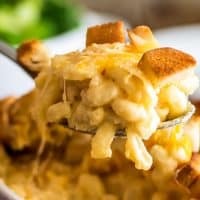 The macaroni is super cheesy and creamy, and the toasted bread topping is crisp and crunchy and makes for a perfect combo. This is a fabulous vegetarian meal for two or an easy side for three to four people. It’s also very simple to make since all you have to do is boil pasta, whisk together butter, flour, milk, and cheese for the cheese sauce, and toss some bread with butter to go on top. It comes together in less than 15 minutes and then gets popped into the oven until the bread is toasted and it’s ready to go. 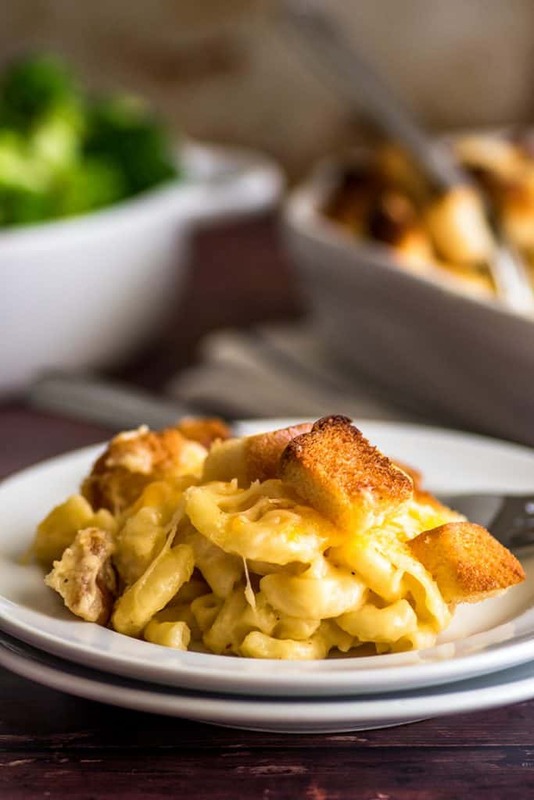 This Deluxe Macaroni and Cheese for Two is quick and easy to throw together and makes the perfect vegetarian meal for two or side for three or four. Preheat your oven to 375°F and lightly grease a 7x5-inch baking dish (or any oven-safe dish of a similar size). In a medium pot of salted water, cook macaroni according to package instructions until al dente. Drain and set aside. While your pasta is cooking, in a medium pot, over medium heat, melt butter. Add flour and whisk together until golden, 30 seconds to 1 minute. Whisk in milk and continue whisking constantly until mixture thickens and becomes bubbly, about 3 to 5 minutes. Add 2/3 of the Cheddar and 2/3 of the Parmesan and stir until smooth. Add a generous pinch of cayenne and nutmeg (if desired) and salt and pepper to taste. Add drained pasta to your cheese sauce and stir. 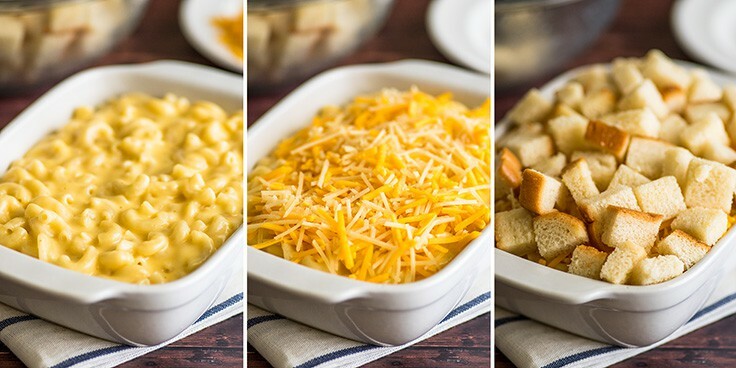 Pour mac and cheese into your prepared baking dish. Sprinkle remaining Cheddar and Parmesan over the top. Place your bread cubes into a medium bowl and pour melted butter over the top. Stir to coat all the cubes. 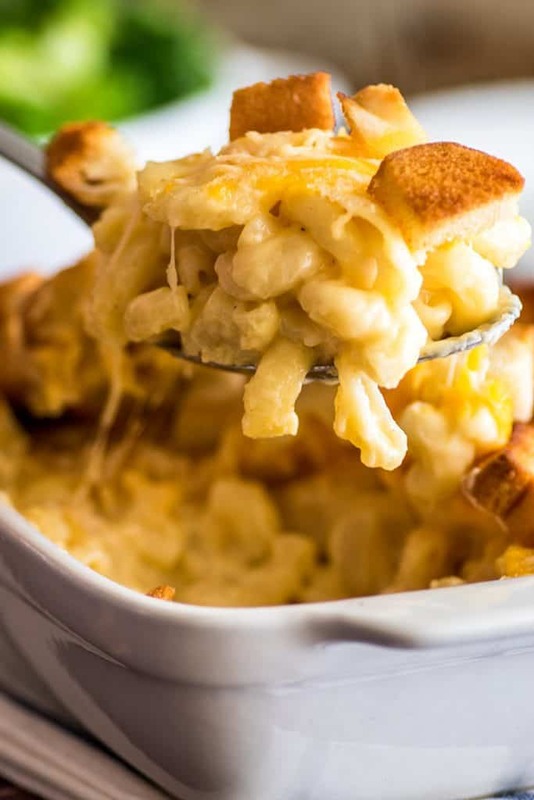 Pile bread over your mac and cheese. (If your baking dish looks precariously full, place on a cookie sheet before putting it into the oven to avoid overflow.) Bake for 10 to 15 minutes, until bread is toasted. Great pic. I could eat this for breakfast! I love your web sight. It inspires me! the time. We all have our moments. Enjoy your up coming week-end. Could you add some mustard if you want to make it extra savory? And possibly some other cheese instead of the romano? Just curious for tweaks … but you have great recipes!! Thanks! You could definitely use mustard. I’ve never done it, but I hear it’s quite tasty. And for alternative cheeses, I feel like gruyere is always a yummy, classy addition to mac and cheese!